I'm jointly responsible for managing our Cambodian team, and I spend the balance of my time crafting great adventures for travellers who are prepared to leave the well-worn trail. My approach to travel has always been the same and that is to give people the time and the opportunity to truly experience the country they are in. South-East Asia houses some of the friendliest countries in the world, I love organising tours in such a way that our customers can experience this for themselves and become advocates for South-East Asian travel. "A self-confessed Cambodiaholic my speciality is cycling trips both here and in the neighbouring countries of Laos and Vietnam. Sri Lanka is also an area of speciality - a perfect destination for cycling with unmatched environmental conservation. 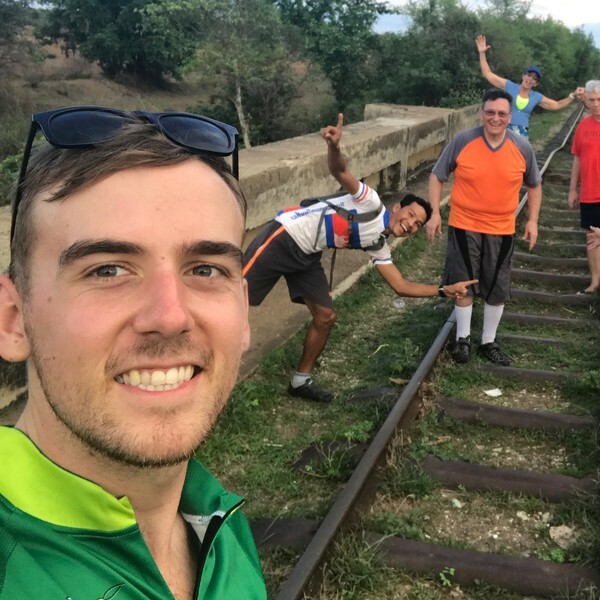 I specialise and enjoy building itineraries for people to give them a genuine insight into the countries we operate in, no way of which is better than on the two wheels of a bicycle. As some of my best memories are travel with my family, I also relish the opportunity to work with families to build an active adventure that will be talked about around the dinner table for decades to come. "Having travelled extensively in Australia, I started looking outwards during my late teens for the next adventure. My first trip to South-East Asia was a very typical shuffle from one tourist hot spot to the next where I grew to hate the narrow view of the country I saw. After a few chance encounters in Cambodia I learnt how rewarding travel can be when you are welcomed into the lives of the local people, something I now take great pride in offering for those I plan travel for. After a quick stop back in Australia to quit my job, I have been in South-East Asia since calling Siem Reap Cambodia my home for the foreseeable future. " "Heading back to Vietnam with my father for the first time since his service with Australian army in the war was probably one of the most touching experiences of my travelling life. He had always lacked the confidence and interest in returning to Vietnam, but after a few years of seeing my photos, he decided it was time. I had been Vung Tau, Nui Dat and Cu Chi many times before, but taking him back was going to be a completely different ball game. I called in a few favours from people I knew in the area to get a fellow veteran and some locals to show him their old base and battlefields. I remember arriving in the area which housed the old Aussie army base where two years of his young adult hood were spent. There was nothing left, the trees had regrown and the only remaining memory was a mound which was built as a natural amphitheatre where they had guest performers on their days off. As we drove the area in the van the only familiarity for him was the light poking through the row after row of rubber plantations. Seeing the places in a different light, a peaceful light, eased his mind. But more than that it was the days spent with amazing Vietnamese people, a time of sharing experiences, laughs and sorrow that was the true healer. This is often my biggest inspiration in South-East Asia, the resilience these countries have. Most have experienced conflict in recent history, yet all have a positive, welcoming and forgiving attitude. Most countries in the region have bound together to forge a future which holds no room for the negativity of the past. It was the perfect trip with my father, we spent a week looking back, then a week experiencing the future of Vietnam and Cambodia. Two countries which have so much to offer beyond their dark histories. "